This is the last day of the eventful year and a general despondency prevails among us. Many are talking of the good old times we used to have at home about this time, or in camp. Story telling among us occupies the dark lonely hours from 6 to 10 p.m. A sickening feeling comes over us as we realizes that we are prisoners with no immediate prospects of being released by exchange…. The Rebel guard say that the “Yankees are dying right smart now at the hospitals.” We learned that they were buried in trenches out back of Libby Hill, which is next to Church Hill, east of us. So we die like dogs, and are buried like dogs! The Rebels furnished us with 300 sheets of coarse paper and brown paper envelopes so that we could write home today. We are limited to twenty words, envelopes to be left unsealed so that Turner may read them first before posting. We advise those to whom we write to enclose a 10 cent silver piece by return mail if they answer our letters or they would not be received over the Rebel lines. Pieces of lead pencil were furnished us also to write with. Very few of us wrote at all. Many had forgotten the addresses. Others would not let their friends or relations know how they were suffering. Nothing could be sent us by our friends, for the Rebels would appropriate the things to their own use. And, knowing that Turner would inspect and read every letter, many would not give him the grim satisfaction of doing so. Walsh, Halley, Rhineheart, and myself wrote home. We just said that we were captured by Mosby 27th November last at headquarters General French at Brandy Station, and that we were all well and in good heart looking for an early exchange…. 1863 had been a particularly good for Confederate Major John Mosby. Early in the year, he had got permission to create an independent group of partisans which was allowed to operate separate from the other cavalry commands in Virginia. Company A, 43rd Virginia Cavalry had its share of secretive and successful missions; they captured Union generals, regularly raided supply lines, and caused a lot of trouble for the Yankees. Private Robert Knox Sneden was one of the unfortunates Yankees captured by Mosby during a raid on General French’s headquarters. A thirty-one year old Canadian who had moved to New York City a decade before the Civil War, Sneden had worked as an architect and then joined the 40th New York Infantry. During the war, he moved around, serving as a cartographer or working in logistics for several Union generals. 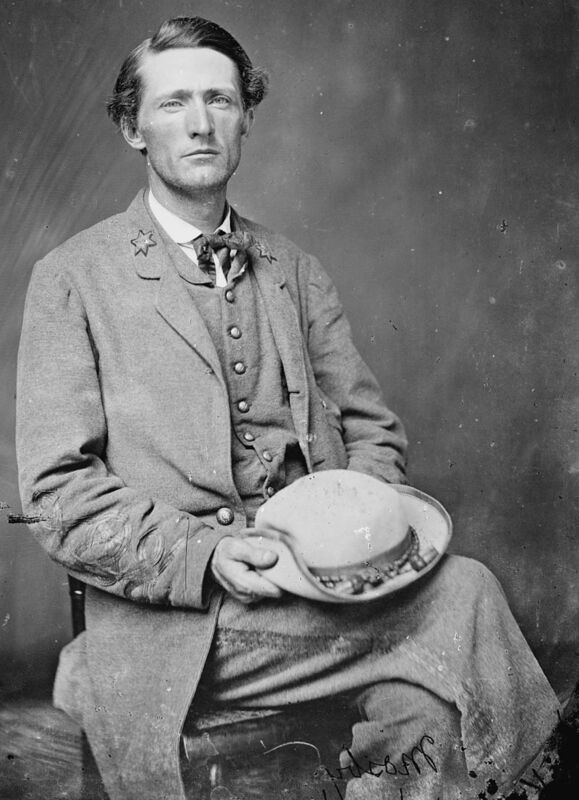 Sneden had been assigned to William H. French’s staff during the Mine Run Campaign and on November 27th got captured when the Confederate partisans arrived. Sneden spent his first months of captivity in Richmond, lodged in a tobacco warehouse turned prison that stood beside the infamous Libby Prison. His guards’ comments about dying Yankees would have been especially troublesome since he was fighting typhoid fever. 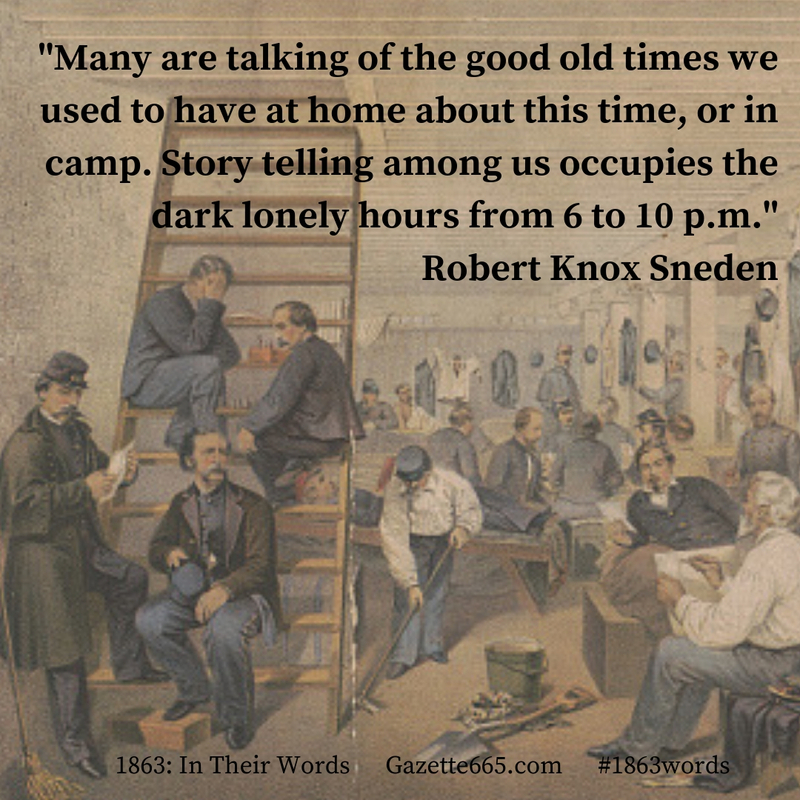 In February 1864, Sneden would be moved south to a new prison camp called Andersonville. Ten months later, he would be exchanged. One of the remarkable things about Sneden was his determination to create a record of his experiences. While some soldiers wrote detailed accounts (primary sources), Snowden went a step farther. He created illustrations. He sketched battles, camps, and prisons – and later – after the war, he turned the sketches into watercolor images. His journal and illustrations survived and are preserved and published, giving researchers a glimpse into scenes of historic importance through a soldier’s eyes. Even in Richmond’s prison and Andersonville, he created sketches and adding to the knowledge and memory of those places. Virginia Historical Society and Library of Congress have preserved Sneden’s illustrations and the collection has been called “the largest collection of Civil War soldier art ever produced.” If you want to see the sketches, his maps are available here and some of the sketches here. For the Union soldiers in Confederate prisons, New Year’s Eve was not a joyous time. Still, they spent some time talking over the past year – something many of us will do at some point today. That part of the account really stood out to me because it’s a reminder that no matter where we are, no matter how rough or amazing the year may have been, it’s important to review the happenings and be thankful for the good times. We weren’t captured by John Mosby and we aren’t sitting in a Richmond prison. But we have freedoms because those soldiers did. Maybe this primary source will add some perspective and new things to consider as we look back on our own experiences in 2018…just as the soldiers remembered 1863.